How would you rate your level of smoothie-making expertise? When do you like to drink smoothies? Would you like to subscribe to the SmoothieWorld email newsletter? 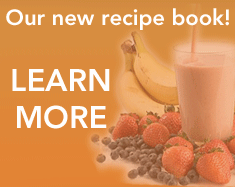 SmoothieWorld features smoothie recipes submitted by our community of users. Here are some of the highest rated recipes of the last 30 days. Submitted by user iosborn22, this smoothie has recieved over 20 5 star ratings and its orange juice and banana base make this a great choice for breakfast! Submitted by user smoothj282, this smoothie combines the exotic ingredients passionfruit and mango. The result is an invgorating and delicious beverage that is great any time of the day.